Sinclair Broadcast wants to "Stirr" up streaming. The nation's largest owner of television stations launched a free, ad-supported streaming service Wednesday drawing on local news, sports and other programs from the 191 TV stations it owns in 89 U.S. markets. Sinclair said the motivation behind Stirr is in part to help viewers "access the local news and lifestyle programming that is relevant to their everyday life." Sinclair was admonished by media watchdogs in April after the sports news service Deadspin pieced together clips of dozens of TV anchors for Sinclair reading from the same script. The script warned viewers about "biased and false news" from other media outlets. At the time, President Donald Trump tweeted his support of the company. Sinclair defended the effort as a way to distinguish its news shows from unreliable stories on social media. Stirr comes just months after Sinclair's $3.9 billion bid for Tribune Media collapsed because of regulatory concerns, ending a bid to create a massive media juggernaut that could have rivaled the reach of Fox News. Patrice Cucinello, director at Fitch Ratings, said the service gives Sinclair another outlet for its news and general entertainment content, while paving the way for a more national footprint. "Sinclair has always had grand ambitions to be bigger, not just as a TV broadcaster but as a source of local programming, and this is just another facet of that strategy," she said. It will also help them reach a younger audience than that which tunes into its TV stations. Fox News launched a paid subscription service Fox Nation in November , emphasizing long-form programming and short-form commentary from conservative hosts on Fox News Channel. NBCUniversal plans to launch an ad-supported streaming service next year, while CBS already has a subscription service called CBS All Access. These join offerings from tech companies such as Netflix. On Thursday, Amazon announced a free, ad-supported service called IMDB Freedive. Media companies such as Disney are also starting streaming services. The centerpiece of Stirr will be a digital channel called Stirr City. It will be tailored to a viewer's location and carry local news and other programs airing on that city's station. However, viewers will be free to choose a different city. Broadcasters are typically barred from doing so, particularly with sports, though Sinclair appears to be focusing on high school and other local teams for which rights wouldn't be an issue. 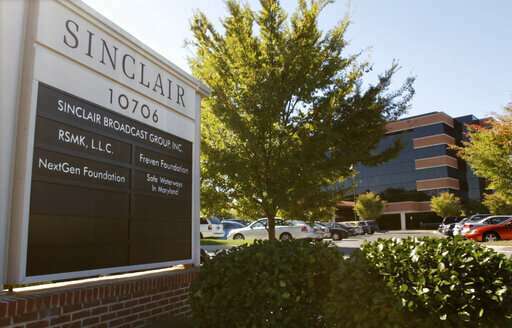 Sinclair, which is based in Hunt Valley, Maryland, doesn't run its own national television network, but rather carries programs from major networks such as ABC and NBC. So when network programs air on the local station, Stirr City will instead have alternate programs, such as a movie. The Stirr service will also carry separate digital channels that Sinclair doesn't own, including Cheddar business news, NASA TV, the World Poker Tour and a tennis channel called The T. And Sinclair is developing its own digital channels such for movies, sports and lifestyles. These channels will stream live, just like a television station, but some programs will also be available on demand. Sinclair expects more than 50 channels by year's end. Some examples of programming will include the documentaries "Being Evil" and "The Rise of Bitcoin" and traditional TV shows such as "21 Jump Street," ''Match Game," ''Family Feud." Stirr will also have digital-only programs such as a nightly show from the British tabloid The Daily Mail and a daily poker show.